It is early spring and my mini wildflower meadow looks much like the other lawns in this suburban neighbourhood: short grass! But look closer and you can see the leaves of Cowslips, some with flower heads, Common Vetch, Betony, Self Heal, Birdsfoot Trefoil, Field Scabious, Oxeye Daisies, Common and Greater Knapweed and tiny Yellow Rattle seedlings. There are a good number of Sweet Violet in flower amongst them, but they are also on some of the neighbouring lawns, so their presence will not indicate anything unusual to an onlooker. 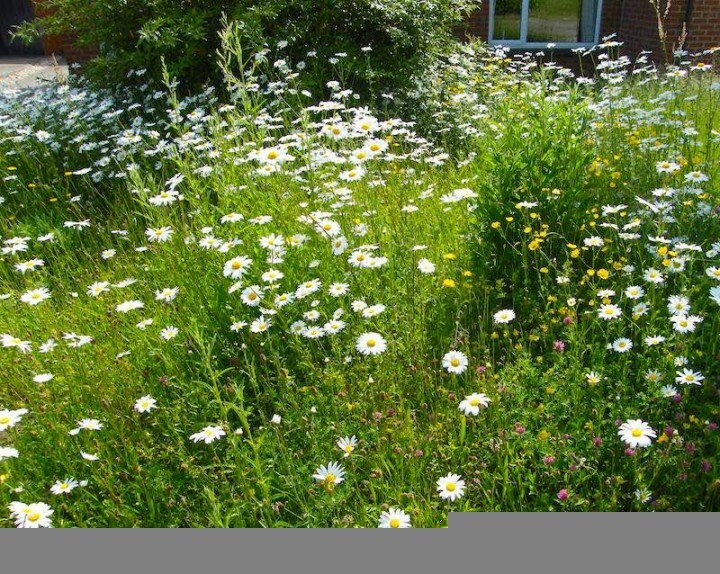 The idea of starting a wildflower meadow in place of my unused front lawn began in 1999 when I read an article in a broadsheet newspaper about wildflower meadows having declined by 97%. I was shocked and immediately thought of the butterflies and wild bees that depended upon them. They were woven into the fabric of my childhood because my grandmother had a wildflower rich hay meadow complete with a cowshed and stalls for two cows in 1958. I especially loved the Cowslips, Tom’s Thumb (it has many local names, but is primarily known as Birdsfoot Trefoil), Moon Daisies (a local name that inspired childhood wonder, compared to Oxeye Daisies), Field Scabious and Meadow Cranesbill flowering there and my young eyes delighted in the sight of butterflies flitting amongst them. Beauty amongst beauty, enriching my childhood. It was here that a lifelong love of wildflowers began. When I grew up I enjoyed wandering in local wildflower rich hay meadows looking for butterflies. Thanks to the Brooke Bond butterfly collector cards that I eagerly searched for and acquired from packets of tea before my mother put it in the cannister, I was able to identify those that I saw. I can remember my joy in seeing and identifying my first ever Orange-tip butterfly sighting in Spring. So, on hearing that wildlife rich wildflower meadows had disappeared to such a massive extent across the UK, my alarm bells rang wildly. Four years passed and nothing much seemed to be happening to restore wildflower meadows across the UK, apart from a local nature reserve project that I was involved in. So in 2004 I decided that all I could do was to start a mini wildflower meadow in place of my lawn, to try and encourage my neighbours to do likewise. Just by their seeing its beauty and wildlife, I hoped that it would start a trend and a river of wildflowers would begin to spread throughout our housing estate which was once agricultural farmland with high soil fertility. Wildflowers need low soil fertility in order to set seed. 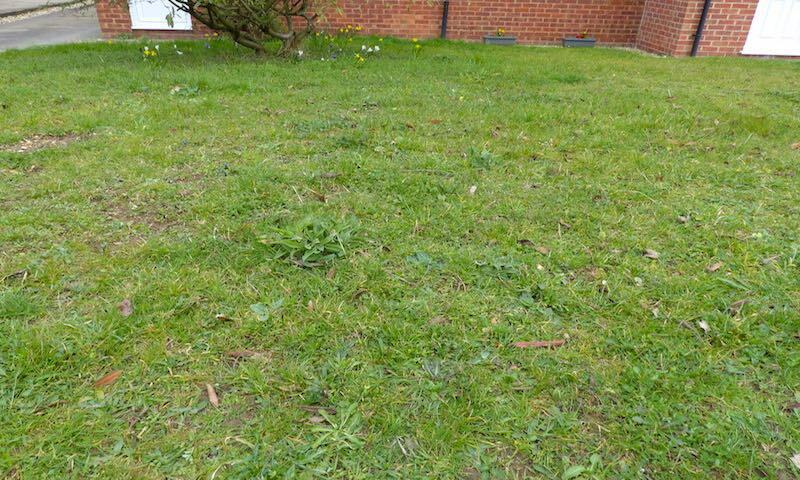 I knew that my lawn had now achieved low soil fertility because when the lawn had been cut over the 22 years I had lived there, the cuttings had been removed and the lawn had never been fertilised. Had the ground still been very fertile, it would have been necessary to remove the top 5-6 cms of soil before sowing the seeds. Jo’s Mini Meadow in early summer in its third year. It is said that it takes at least three years for wildflowers to establish themselves, so I plug planted half a dozen Field Scabious and two Greater Knapweed that were grown from local wildflower seed and hoped! It was indeed three years before the mini meadow began to look like a wildflower meadow with its abundant Yellow Rattle, Oxeye Daisies, Birdsfoot Trefoil, Common Knapweed and Field Scabious being the most prolific scene stealers. Yet the two Greater Knapweed plants with their beautiful, large thistle-like mauve flowers always stole the show when they flowered. The Common and Greater Knapweeds last into September and are the glorious ‘last fireworks of summer’. Over the past couple of years the Cowslips have suddenly taken off and there is quite a profusion of them in Spring. The only flowers not to have germinated from the pack to date are Meadow Cranesbill, Meadow Vetchling, Ragged Robin and Yarrow. But, Hedge Bedstraw with its beautiful, tiny white flowers suddenly appeared on my mini meadow last year from seemingly nowhere. Nature is full of surprises – you just never know what you are going to find! It is one of the delights of having a wildflower meadow: Nature is in charge and after the first year, can cope with drought or flood. I am now beginning to wonder if any orchids will appear this year. But, the biggest surprise of all to date has been the arrival of the Marbled White butterfly to feed on Field Scabious and the Knapweeds. 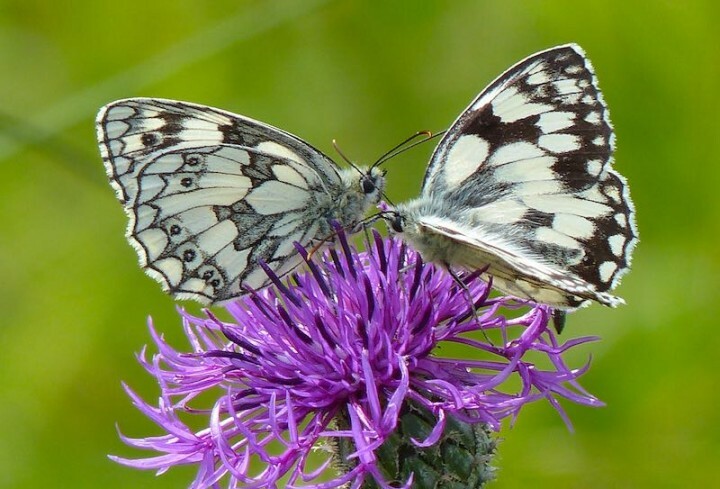 No other British butterfly has such a striking black and white pattern, so it is easily identified. The butterfly probably arrived from a wildflower meadow site about a 10 minute walk from my meadow. As there are none of these wildflowers between the two sites, it shows that butterflies have amazing senses to be able to find their nectar sources. So if we provide the diversity of wildflowers that butterflies need they will find them, as have the Meadow Brown, Ringlet, Green-veined White and Small Skipper butterflies. From the moment it flowers, the meadow is constantly visited by wild bees and honey bees. Nothing delights my ears more than to hear the sound of grasshoppers chirring away and the contented buzz of bees collecting pollen and nectar – the sound of a summer meadow. Another sure way to make certain that we are able to enjoy butterflies is to provide their larval foodplants, so that they can complete their lifecycle from egg, to caterpillar, to chrysalis, to butterfly and round again. Beautiful meadow grasses such as Yorkshire Fog, Cocksfoot, Red Fescue and Sheep’s Fescue are needed by the Marbled White caterpillar and then the Scabious and Knapweed flowers for nectar when it transforms into a butterfly. Meadow grasses tend to be finer and shorter than coarser grasses, so that wildflowers are not dominated by them. Please refer to the guides on the butterflies that you can attract to your garden or meadow by providing larval plants for their caterpillars and nectar sources. My wonderful neighbours joined my wildflower meadow project four years ago, because their son had learnt all about the plight of bees at his school and wanted to transform their lawn into a bee haven. I thought it was such a splendid gesture and so insightful of their son who was only aged 7 at that time. One neighbour complimented me on the meadow just before he moved and said that he was going to sow one. So the mini meadow has now doubled in size, although a river of meadow lawns has yet to flow through the housing estate. Having said that, I have found two mini wildflower meadow areas on other parts of the estate which I will photograph this year for you to see. I look forward to giving you reports about the meadow’s progress, including some on my new orchard meadow, throughout the year and about the wildlife that arrives. I hope that my stories will inspire you to start a project, or to tell me about your own. You do not need any expertise to attract wildlife to your garden. It is as simple as providing the habitats they need to turn your garden into a nearby wild haven. NearbyWild – What’s the idea ? Please use NearbyWild on Twitter and on Facebook to post comments and feedback - we'll try and respond as soon as possible. Copyright © 2019 NearbyWild. Powered by WordPress. Theme: Accelerate by ThemeGrill.